Chris Holtmann didn’t wait a beat. After announcing Kaleb Wesson would enter his name into consideration for the 2019 NBA Draft, he quickly clarified, saying the big man would retain his eligibility and have a chance to stay at Ohio State. Wesson’s goal – as is the case for most college basketball players – has always been to make it to the NBA. So Holtmann wants to facilitate that dream. However, it would be a shock if Wesson kept his name in the draft and did not return for his junior year. In his second year as a starter, Wesson increased his averages to 14.6 points, 6.9 rebounds and 1.9 assists per game while shooting 50 percent from the floor and 34.7 percent from beyond the arc. Wesson has room to develop much more in college before turning pro, and even if he stays in school, this is a step for him to learn about how the NBA views him as a prospect and where he needs to improve. Holtmann said Wesson has not decided if he will sign with an agent or not. Unlike in past years, the hiring of an agent would not mean he could not return to Ohio State. Instead, he could hire an agent who takes him through the pre-draft process, represent him in meetings and set up workouts. Until Wesson makes his ultimate decision, Holtmann said he’ll have a staff member checking up on him for daily updates. The announcement of Jaedon LeDee left Ohio State without a backup to Wesson, and it opened a second available scholarship for next season’s team. Unsurprisingly, Ohio State has targeted what Holtmann called an “interior backup guy for Kaleb.” During Wesson’s three-game suspension late in the season, the lack of a true backup center clearly held the Buckeyes back. Ibrahima Diallo, a 7-foot 2019 prospect, will eventually decide between Ohio State and Pittsburgh. Daniel Giddens, a former Buckeye center who is now looking to transfer from Alabama, reportedly took a visit to Ohio State last week. Holtmann also said there’s a chance the Buckeyes add a different position, throwing out a “versatile guard/wing” as a possibility, but adding a big man who can play immediately next season behind Wesson is the top priority. Holtmann said the team is “getting there” in terms of finalizing its 2019-20 roster, but nothing is imminent. “Who we're going to add in terms of our roster, that's still fairly fluid right now,” Holtmann said. Since Ohio State has two scholarships open, it could hypothetically add a pair of players to its team. However, Holtmann said the team will not add two players who are eligible to play the 2019-20 season due to a lack of space in the rotation. The Buckeyes have had two players transfer in the past year – LeDee and Micah Potter – and both stemmed largely from a lack of on-court opportunity in the position they hoped to play. Though Holtmann doesn’t intend to add two players who can play right away, he said he’s open to add a transfer who has to sit out a year. The Buckeyes employed that strategy last year by adding C.J. Walker, a transfer from Florida State. Walker sat out the 2018-19 season but has two seasons of eligibility remaining. With Mike Schrage leaving Ohio State’s coaching staff to become Elon’s head coach, Holtmann has to replace one of his three assistant coaches for the first time with the Buckeyes. 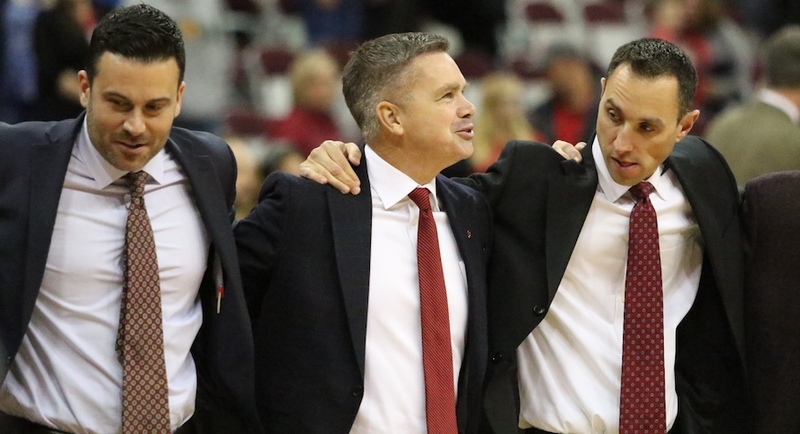 Holtmann intimated on Wednesday that he almost had a second vacancy, hinting that either Ryan Pedon or Terry Johnson came close to leaving for another job, too. Holtmann said he hoped to fill the position Schrage left by “the first AAU weekend” at the end of April. In the interim, special assistant to the head coach Mike Netti has temporarily picked up many of Schrage’s responsibilities. Netti and director of player development Scoonie Penn are two candidates already working for Ohio State who will be considered for the opening, Holtmann said. Not having Schrage anymore means Ohio State will have to replace his two decades of experience in college coaching. He also was the lead recruiter for DJ Carton and Luther Muhammad. Thus, Holtmann’s next hire will be important. If Holtmann decides to look at someone not currently in his program, Michael Lewis could be a candidate for the open assistant job. Holtmann and Lewis worked together as assistant coaches at Butler for a season before Lewis worked under Holtmann for two years. Lewis then left to join Tim Miles’ staff as an assistant coach at Nebraska. But since Miles was fired, Lewis is searching for his next opportunity.